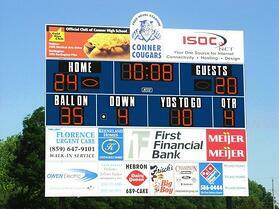 Scoreboards 101: Which one is Right for Your School? Has that score flip chart seen its better days on the court? Does the crowd have to twist their neck backwards or squint under a net to see the score on each possession? If so, it’s probably time to check into a new scoreboard. If your school has been contemplating a purchase of a new scoreboard, there are varieties you should examine before making a choice. This style of scoreboard is perfect for elementary school games in which minimal information is needed for display. This type of scoreboard can be displayed for scoring and timing of an athletic event, then put away and stored. It can be transported from game to game or stored away safely after each game. This is the most economical option for schools with basic sporting events for smaller children. This type of scoreboard will become a permanent focal point in your gym and will completely revolutionize crowd involvement as they fully engage in seeing the score change and knowing game statistics. The start up cost of wiring this scoreboard is a bit more, but will pull a crowd together at sporting events. These types of boards are helpful in upper grades or high school when playing various sports such as soccer, basketball, hockey, and volleyball. The time, score, game period, player, and team fouls can all be displayed in one place. Great advancements have been made in these scoreboards, which generally use LED (light emitting diode) technology and sometimes even wireless capabilities. More recently, scoreboards have been designed to be more user-friendly so that students can operate them with ease. If your school is hoping to create an all around virtual experience, scoreboards can also be used with computer software to create a “big league” effect through video display and a movie type atmosphere. Another important factor to consider when looking for a new scoreboard is choosing the right size scoreboard based on your gym or field's size. Not only can Toadvine Enterprises help you find the perfect scoreboard your facility based on your school's budget, we can also help you choose the correct size. Contact us to learn more. They are the center of school spirit and pride. They give definition to who your school is and add personality and distinction to your program. The mascot is one of the most crucial decisions any school has to make. Here is our top list of the most uniques mascots in our region. 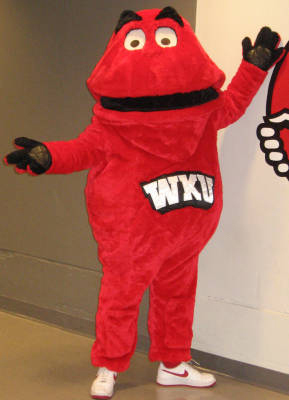 Kentucky: The Western Kentucky Hilltopper is always a great conversation starter. How can you make a mascot out of the top of a hill? You make a rounded pyramid and give it eyes and a mouth. Big Red, as he is affectionately referred, is always ranking high on the national scene as a favorite, and although he doesn't strike fear in his opponents, he holds a special place in our hearts. Ohio: The Dayton Flyers is a very unique mascot. He has a moon boots, a flight suit, and flying goggles and leather helmet—but there is no plane. He ranks high for originality and his full teeth grimace can help the crowd get behind their team with intensity. Akron has Zippy the Kangaroo, and just like Big Red, he does not strike fear into his opponents... but he is unique and fun. Having a mascot that people enjoy can be a real advantage. Tennessee: Middle Tennessee Blue Raiders gets honorable mention. With a lightning bolt for a tail and bright white wings, their mascot certainly stands out in a crowd. "Lightening" as he is referred to, eludes to the schools aerospace programs and also points to the region's history of breeding walking horses. East Tennessee State has a Buccaneer as their mascot. Buccaneers are not all that uncommon as mascots. We found it interesting that most schools that have a buccaneer as a mascot are usually located on the water. "Bucky the Pirate" is his name and he has a parrot named Pepper. Say that 10 times fast. Indiana: Purdue has the Boilermakers as "Purdue Pete." What is a Boilermaker you ask? A Boilermaker is someone who makes boilers or a metalworker in heavy industry. And according to Wikipedia, (LINK) The nickname Boilermakers goes back to 1891 when the Purdue football team defeated nearby rival Wabash College in Crawfordsville, Indiana 44–0. Mascots have become even more popular than some teams. They can have big impacts on a schools' tradition and branding. Many schools revamp their mascot's look every 10-15 years to keep them looking modern. Although some mascots need no improvements because they are simply timeless. Let us know what your favorite mascot is. Did you notice the theme? 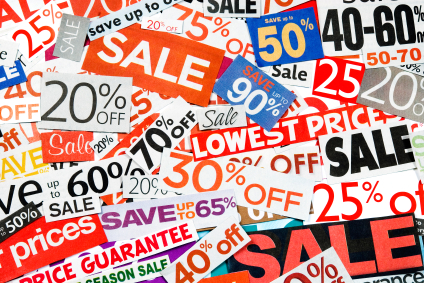 Seven out of 10 of these categories are specifically titles with “banner” or “advertising.” With Dant’s slick new designs and advertising products, they are not only light weight and user friendly, they are nearly 60% less cost compared to traditional aluminum signage. You can put those savings right back into new equipment and facility improvements. It’s a win win; you get more exposure and impressive, modernized ad pieces that draw the attention of your fans and followers, and you get the opportunity to engage new business ad support for your organization. Call and schedule a time for us to show you this product line from Dant Clayton. The VIP section may sound showy but many of the elite national high school and collegiate sports programs are embracing this idea and it is paying off. You might be surprised to find out how many of your fans would also embrace this idea and jump at the opportunity to participate in a VIP section. Let us walk you through some of the unique products Dant Clayton offers in this category and how this enhancement can elevate your program. How are you recognizing the fans and supporters of your program and making them feel special and important? In 1937, the Cubs had a scoreboard designed out of sheet metal. Originally it was painted in orange and red which was suppose to emulate a sunset at sea. 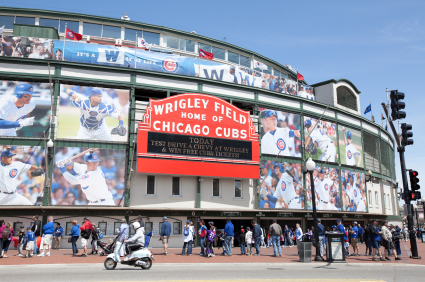 Well, with the Cubs playing so many day games, they eventually painted the scoreboard green in 1944. Why? To decrease the amount of sunlight reflected off of it because the glare would hit home plate and make it difficult for batters to track pitches. Of course they have come a long way from the manual scoreboard of the 1930s and now have made further improvements with a 70-foot digital scoreboard in right field. Above the scoreboard is what they call the “Budweiser Patio,” a 150 seat (not bleachers), all-inclusive baseball experience. They did this to increase their chances of landing all-star games and increase revenue for the field itself. We know the improvements that you make to your facility, no matter how small, always draw attention and add to the fan support for your school or organization. We all want to grow in professionalism and find ways to improve our programs, retain talent, and recruit high level athletes. A scoreboard is a great place to start. Nevco has a huge product line of traditional digital scoreboards and more elaborate designs that will meet any budget. With advertising placement on many designs, there are creative solutions to lowering costs of much-needed sports and facility equipment. We would be glad to talk to you about your facility needs and how we can exceed your expectations.